Results: Northern Mat & Bridge mobilized within 24 hours to start one of our largest projects yet. 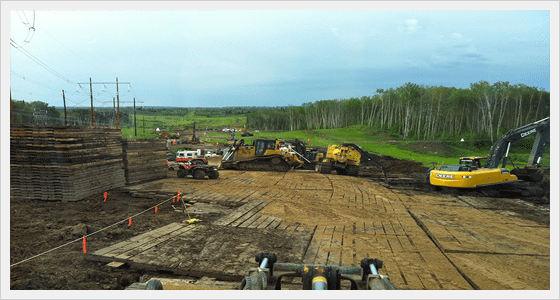 With 17,600 access mats placed on multiple access routes within the spill zone. We provided construction and engineering staff with access, so they could assess the scope of work to be determined moving forward; we provided access to areas otherwise inaccessible. With our help the customers were able to assess the rupture and put a stability study and recommendation in place. This project was ongoing for 10 months and projects more work in the future.